I am in Minnesota at the Mid States Trade Show, with my publisher. We are showcasing my new cookbook, BUSY WOMAN"S SLOW COOKER COOKBOOK, and other books they publish. This is the second year that I have attended the convention with them. It is a lot of fun! I love to meet people and tell them about my cookbook. win BOTH of my cookbooks! 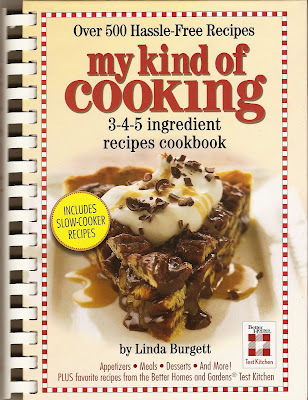 MY KIND OF COOKING COOKBOOK, has over 500 yummy recipes using only 3, 4, or 5 ingredients. It has everything from appetizers to desserts and everything in between. It also includes slow-cooker recipes! 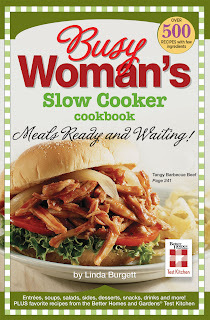 BUSY WOMAN'S SLOW COOKER COOKBOOK, has over 500 slow cooker recipes with only a few ingredients. Recipes take only minutes in the kitchen. Includes slow cooker tips. On Friday, I will be posting more prize winning recipes! Coat inside of slow cooker with nonstick cooking spray. Add all ingredients. Mix well. Cover. Cook on low 4 to 6 hours or high 2 to 3 hours. Makes 8 servings. I made this easy recipe during one of my cooking demos at the Iowa State Fair. It is not only a tasty side dish for lunch or dinner but by adding some chopped, cooked bacon, it would also be delicious for breakfast. It would be kind of like Cracker Barrel's Hash Brown Casserole. Extra Cheesy Hash Browns and Tortellini Toss were the recipes that got the most comments and questions from the audience during my cooking demos. People were amazed that you could get so much flavor out of just a few simple ingredients. I made a new blogger friend while I was at the Iowa State Fair. Heidi, not only purchased my cookbooks but she wrote about them on her blog, Hens & Chicks Quilt Studio. Please visit her wonderful blog, you will be happy you did! On September 3rd, I will be doing a drawing from the Followers on my blog. The drawing is open to all of my Followers, regardless of where they live. I will be giving away a copy of MY KIND OF COOKING COOKBOOK and my new, BUSY WOMAN'S SLOW COOKER COOKBOOK. Check out the great giveaway at my blogging buddy, Bo's Blog (say that three times fast), Bo's Bowl. Not only does he have great giveaways, his recipes are incredible! One visit to his blog and you will see why I faithfully follow it. Check out my friend Pam's blog, Pam's Midwest Kitchen Korner, for more great recipes! Line a jelly roll pan with nonstick foil making sure to overlap the pan on all sides. Step 1: In a microwave safe bowl, melt 1 bag of chocolate chips using either the defrost setting or 10% power for 1 minute. Check and stir. If not completely melted microwave at 10 to 20 second intervals until melted. Spread melted chips onto jelly roll pan and put in freezer until chocolate sets up. Step 2: In a microwave safe bowl, combine 6 ounces of chocolate chips, 6 ounces of butterscotch chips and 1/2 jar of peanut butter. Melt using directions in step one. Spread onto chocolate layer and set back into freezer until firm. Step 3: In saucepan, combine butter,milk, maple flavoring and pudding mix. Cook mixture until it comes to a boil. Boil one minute and remove from heat. Using an electric mixer beat in powdered sugar until smooth. Spread onto second layer and return jelly roll pan to freezer until firm. Step 4: Melt remaining chocolate chips, butterscotch chips and peanut butter as in step one. Once the mixture is completely melted stir in the jar of dry roasted peanuts. Spread onto third layer and return pan to freezer to firm up. Once firm cut into bars and store in refrigerator or freezer. These bars are very rich and you will want to cut them small. My number one fan, Darrellyn. but I was even more tired than I looked! Part of the fun of being at the fair is getting to try prize winning recipes. This Maple Bun Delights recipe took first place in a cooking contest sponsored by my number one fan, Darrellyn. 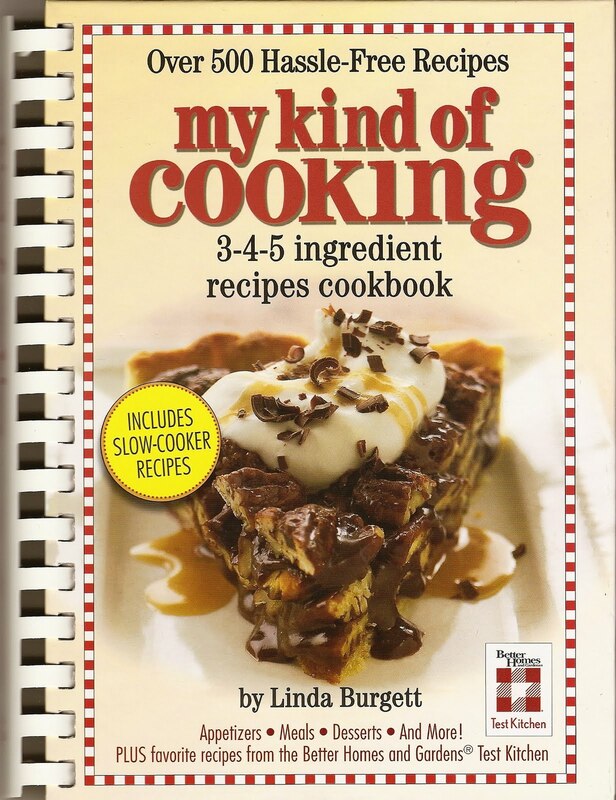 She has not only all of my cookbooks, but she also has all of my mom's cookbooks too. I have been doing cooking demos for three years at the Iowa State Fair and Darrellyn has attended everyone! She took the cooking demo photos below. The view from the mirror over the cooking island. I will be drawing a name from my followers to win copies of my cookbooks, MY KIND OF COOKING and my new BUSY WOMAN'S SLOW COOKER COOKBOOK, on Friday, September 3rd. This contest is open to all of my followers. I will mail the cookbooks to you regardless of where you live. Check out the great giveaways at my blogging buddy, Bo's Blog (say that three times fast), Bo's Bowl. Not only does he have great giveaways, his recipes are incredible! One visit to his blog and you will see why I faithfully follow it. Check back on Friday, when I will post the quick and easy recipe that received the most comments from my cooking demo audiences. Preheat oven to 400 degrees. Spread pizza crust on pizza pan. Lightly coat top of pizza crust with cooking oil. Sprinkle garlic salt on crust. Bake crust for 5 minutes. Set aside. In small sauce pan, melt butter over low heat. Add garlic, saute until golden. Add flour, stir until smooth. Cook until bubbly. Add cream gradually, stirring constantly. Cook until it comes to a boil and thickens. Salt and pepper to taste. Remove from heat. Add 2 cups cheddar cheese, stir until melted. Add cooked pasta to cheese sauce, spread over pizza crust. Arrange spam over top. Sprinkle 3/4 cup cheddar cheese and mozzarella cheese over top. Bake 6 to 10 minutes or until golden brown. The Spam recipe competition is a big contest at the Iowa State Fair. This year the winner was Deana Wright. You may recognize the name, she was the third place winner in the Holiday Cookies and Dessert contest I judged. In that contest she made potato chip cookies. Apparently Deana has a talent for taking strange ingredients and making a crazy creation that taste fantastic! This pizza is comfort food on steroids! The rich flavor of homemade mac and cheese, combined with the slightly salty ham tasting Spam, piled on top of a soft pizza crust, makes it easy to see why it took first place. This pizza would be a big hit in Hawaii, where they put Spam on everything. Below are a few pictures I took at the Iowa State Fair. Successful Farming Magazine contest that I judged. I will be drawing a name from my followers to win copies of my cookbooks, MY KIND OF COOKING and BUSY WOMAN'S SLOW COOKER COOKBOOK, on Friday, September 3rd. Another great giveaway can be found at my friend Pam's blog, Pam's Midwest Kitchen Korner. Please check out her incredible blog and sign up for your chance to win! I judged a Holiday Cookies & Dessert contest last Thursday. Below are the First, Second, and Third place recipes. The first place winning recipe was incredible! It was a sophisticated dessert that was moist and full of rich flavors. This cookie was delicious! It may be decorated for Halloween, but it would make a perfect addition to my Christmas cookie basket. The almond bark coating on the outside of the cookie, kept the chocolate center moist and slightly gooey. I didn't want to stop eating this one! Using food processor, grind cookies to a fine powder. In large bowl, combine cookie crumbs and cream cheese, using an electric mixer. Mix well. Roll into small balls, place on wax paper. Refrigerate at least 45 minutes. Melt almond bark in microwave for 2 minutes or until melted, stirring after every 30 seconds until melted. Dip cookie balls in melted almond bark, coating completely, place on wax paper. Cool. I love the combination of sweet and savory. This cookie has that wonderful combination. It is a strange combination, but it really works! When I make these cookies, I am going to experiment with leaving out the Jello powder. In medium microwaveable bowl, melt chips in microwave for 2 minutes, stirring after every 30 seconds. Divide chocolate into 3 bowls. Add 2 tablespoons blue Jello to one bowl, 2 tablespoons Jello to another bowl, and keep one bowl plain. Mix well. Add equal amounts of potato chips and pecans to each bowl. Mix well. Drop by spoonfuls onto wax paper. Cool. Arrange cookies into a flag design. Sprinkle additional Jello on top if desired. It has been a really fun and busy week! Between cooking demos, the contest, and signing cookbooks, I have not had much time to get out and take pictures of the fair. Speaking of cooking demos, I love doing them! It takes a lot of preparation to put one on, but I love every minute of it. I have one hour in the behind the stage kitchen to prepare and set everything up before the demo. I do the cooking demo in front of a live audience. The audience at one of my cooking demos, 10 minutes before I started. When it comes to food at the Iowa State Fair, pork reigns supreme! In the past 30 years, more that 560,00 Iowa Chops have been grilled and served at the fair. On average, a fair patron receives a pork product about every 4 seconds. I think Paula Deen would love the Iowa State Fair. Why you ask? Because it has a Butter Cow and you know how much she loves butter! I always make a visit to the Butter Cow. It wouldn't be the State Fair if I didn't. The Butter Cow has been an attraction at the Iowa State Fair since 1911.
this year they have a butter Green Eggs and Ham display. I snapped a few pictures of things I saw along the way. It's Iowa, so you know there is going to be prize winning corn. Prize winning 1,323 pound pumpkin. Big D, the Champion Big Boar, weights 1,212 pounds. Last but not least, the Ugly Cakes! This is a competition open to kids only. The object of the competition is to make the ugliest cake possible, using only edible food items. Check back on Friday, for more Prize Winning recipes!